In 2018, the Bureau of Labor Statistics reported projected a 13% increase in employment in the information technology sector between 2016 and 2026. Even during the recent economic recession, employment in the IT industry only dropped about 1% and quickly recovered. Careers in IT are steadily growing and provide professionals with stability and longevity. Earning a graduate information systems management degree helps professionals advance their IT career. Master's in MIS online programs are ideal for current professionals who want to earn higher credentials, sharpen their technology skills, and increase their earning potential. Professionals currently working in the IT industry can earn their master's in MIS online according to their own schedule. Graduate programs in information management systems build on skills gained during undergraduate programs, including foundational knowledge in information security, risk management, programming, business foundations in IT, and software design. Many information systems management degree programs offer students opportunities to earn certifications in areas such as business intelligence, data security, and programming. Available courses, concentrations, and certifications vary by program, so consider your academic and professional goals when selecting a school. Also explore requirements such as internships and thesis projects, and determine the requirements that will be most beneficial to your career. Choose a program involving work that directly applies to your current or intended career path. Many students pursuing a master's in MIS online are current professionals who want to earn higher salaries with a graduate degree. A master's in management information systems prepares graduates to pursue a variety of careers, such as those listed below. Information Security Analyst: Aspiring information security analysts should earn an MIS degree with a certification or concentration in data security. These professionals create and implement specialized data security systems to protect an organization's digital information. Computer and Information Research Scientist: These scientists think of innovative ways to utilize technology. They experiment with current computer technology and research possibilities for using technology in business, science, government, and medical settings. Computer Network Architect: Computer network architects design, implement, and maintain various types and sizes of computer networks, including small, local office networks and large cloud data networks. See also: What can I do with an Engineering degree? Florida State University ranks #1 among The Best Online Master's in Management Information Systems Degree Programs! Based in the Sunshine State's capital of Tallahassee, Florida State University leverages its vast resources to offer numerous online programs through its Distance@FSU department. The school's master of science degree in management information systems -- listed under the umbrella of FSU's College of Business (COB) -- is a part-time program that requires 24 months to complete. Students must earn a total of 33 credits, including seven core courses and four elective courses. Most students take two courses per semester, and core courses include information and technology management, corporate information security, and e-business. The program's curriculum does not include any in-person requirements, concentrations, or capstone courses. FSU takes a holistic approach to evaluating applicants, noting the trajectory of each applicant's academic performance, professional background, and GRE scores. Applicants with significant work experience in the IT management field receive a standardized test score waiver from FSU and do not need to submit GRE scores. Students may begin the program in either the fall or spring semesters. Florida State University is regionally accredited by the Southern Association of Colleges and Schools, while the master's in management information systems program is nationally accredited by the Association to Advance Collegiate Schools of Business. All students -- regardless of location -- pay the same per-credit tuition rate. Coursework in the program includes both synchronous and asynchronous elements, with live lectures that the program supplements with discussion boards and additional readings, and assignments due on a weekly basis. Webster University ranks #2 among The Best Online Master's in Management Information Systems Degree Programs! Maintaining a central campus in suburban St. Louis, Webster University is a globally-oriented college, operating campuses across the country, on Air Force bases and in Bangkok, Vienna, and Shanghai, among other international locations. Webster offers an extensive selection of distance learning degrees, including one of the best management information systems graduate programs in the nation. The 36 credit master of arts in information technology management program includes nine core courses. These 27 core credits include studies in organizational behavior, project management for information technology, and information and computer security. The remaining nine credits are completed via elective courses. All students in Webster's program also complete a final project in information technology management. Students also have the option of completing an additional 15 credits to earn a master of business administration degree with a concentration in information technology management. Webster's information systems management degree has earned national accreditation from the Accreditation Council for Business Schools, while the university itself is regionally accredited by the Higher Learning Commission. Designed for working professionals -- especially manager-level employees in IT-related fields -- Webster's program uses asynchronous learning to accommodate busy students. All applicants to Webster's online graduate programs must have earned an undergraduate GPA of at least 2.5. Liberty University ranks #3 among The Best Online Master's in Management Information Systems Degree Programs! Liberty University, located in Lynchburg, VA, is both the largest evangelical Christian university in the world and the largest private, nonprofit university, with an enrollment of 15,000 on-campus students and nearly 100,000 online students. One of the school's many online programs is the master of science degree in information systems, a 36 credit program in which students also choose a “cognate,” or concentration: either information assurance or technology management. In addition to core courses, students complete four courses in their chosen cognate, including studies in IT project management for technology management students and coursework in telecommunications and network security for information assurance students. Liberty's program delivers coursework asynchronously -- with students, who are often working IT professionals, completing their assignments at their convenience - and does not include any in-person requirements. The program is also exceptionally transfer-friendly, as students who have already begun a degree elsewhere may transfer up to 50% of the required credits for the program. Liberty University is nationally accredited by the Southern Association of Colleges and Schools Commission on Colleges. All online students at Liberty pay the same tuition rate, regardless of whether or not they reside in Virginia. Additionally, Liberty's online programs do not have any minimum GPA or standardized test requirements for admission. Embry-Riddle Aeronautical University-Worldwide ranks #4 among The Best Online Master's in Management Information Systems Degree Programs! Embry-Riddle Aeronautical University is most famous for its aviation and aerospace programs. However, the ERAU system -- which operates physical campuses in Daytona Beach, FL and Prescott, AZ -- also maintains a Worldwide Campus that offers a variety of programs to students on military bases and online. The 30 credit master of science degree in management information systems (MMIS) includes a total of 10 courses: seven core courses and three electives. Coursework includes change management and configuration control, information risk management, and global information and technology management. The curriculum does not include any capstone or thesis requirements. ERAU's MMIS program uses asynchronous learning, as students can complete their assignments at their convenience. The program includes both full-time and part-time options; full-time students can complete their degree within twelve months, but many part-time students take longer to finish. Students who have already begun an MIS program elsewhere can are eligible to transfer credit on a case-by-case basis. Generally, the school accepts up to twelve credits from courses in which the applicant earned a grade of “B” or better. The school requires a minimum GPA of 2.5 for applicants to online graduate programs. However, transfer applicants who have already begun graduate work must have a 3.0 average in graduate courses. ERAU has earned regional accreditation from the Southern Association of Colleges and Schools Commission on Colleges. Western Governors University ranks #5 among The Best Online Master's in Management Information Systems Degree Programs! One of the biggest names in online education, Western Governors University specializes in business, teacher training, healthcare, and information technology. The school merged two of those specializations to offer its master of business administration degree with a concentration in information technology management (MBA in IT). Students in the program study core business areas such as marketing, accounting, and financial management, while also developing significant knowledge in IT project management and IT strategic solutions. The curriculum consists of a total of 11 courses -- which includes a final capstone project and a professional portfolio -- and does not include any in-person requirements. WGU curriculums are asynchronous, as students in their online programs earn Competency Units (CU) rather than credits. The school's competency-based system relies on assessments -- students can test out of learning material they already know -- and progress at a faster pace toward their degree. In fact, 98% of students who earn their management information systems degree at WGU finish in 6-18 months. All students at WGU pay the same per-term tuition, regardless of whether or not they live in the school's home state of Utah. Combined with competency-based education, paying tuition per-term allows WGU's full-time MIS students to both finish quickly and save money. WGU is regionally accredited from the Northwest Commission on Colleges and Universities. University of Oregon ranks #6 among The Best Online Master's in Management Information Systems Degree Programs! Based in Eugene, the University of Oregon is one of the flagship universities of the Pacific Northwest. The school maintains a diverse set of distance learning programs, including a master of science in interdisciplinary studies degree in applied information management (AIM). Oregon's 54 credit AIM program includes 44 credits of core courses in research methods, leadership of organizations, and information design trends. The final ten credits are comprised of electives that run four weeks apiece and center on contemporary technologies and best practices. The core curriculum also includes a six-credit capstone experience. Students can select from among four professional specializations: information design, business management, information management, and applied research. Most students in Oregon's AIM program are professionals in the information management industry, and most opt for part-time courses of study. As a result, the program usually requires 30-36 months to complete. However, the program also includes an accelerated option that takes 21 months to complete and requires taking an increased load of courses. Both options use asynchronous learning and do not include any in-person requirements. There are no minimum GPA or standardized test requirements for admission, but Oregon expects applicants to have at least five years of relevant work experience. The school is regionally accredited by the Northwest Commission on Colleges and Universities. Students pay the same total tuition rate whether or not they live in Oregon. Concordia University Wisconsin ranks #7 among The Best Online Master's in Management Information Systems Degree Programs! A Lutheran-affiliated university based in Mequon, Concordia University - Wisconsin also operates campuses in Michigan and online. Concordia's master's of business administration degree includes 15 possible concentrations, including a 39 credit MBA in management information systems program. Students usually complete the program in 1-3 years, depending on whether they pursue full or part-time study. The program's curriculum combines an MBA core with coursework specific to a management information systems degree online. Coursework includes standard MBA areas of study like finance and human resources, along with field-specific courses in project management, systems analysis and design, database management, and training in Oracle's data management software. Students also complete a relevant internship of at least 120 hours to graduate. CU-W primarily uses asynchronous learning in its online programs. There are no minimum GPA or standardized test requirements for admission to CU-W, and each online student pays the same per-credit tuition rate, regardless of whether they reside within the Badger State. Students are not required to visit the campus in Mequon to complete the online program. CU-W is regionally accredited by the Higher Learning Commission, and the school's online MBA programs are accredited by the International Assembly for Collegiate Business Education. 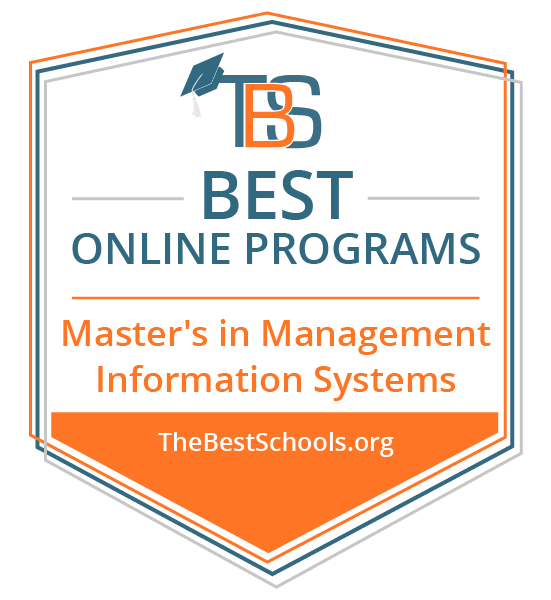 Dallas Baptist University ranks in the Top Ten on The Best Online Master's in Management Information Systems Degree Programs! A Baptist-affiliated liberal arts school based just south of Dallas, Dallas Baptist University also includes distance learning and pre-professional programs. The school's online master of business administration program includes a concentration in management information systems. Students in the program complete at least 36 credit hours, including a 24 credit MBA core and the 12 credit MIS concentration. The MBA core includes studies in managerial accounting, corporate finance, and business ethics, while the MIS concentration includes coursework in systems analysis and design, IT security, and telecommunications. DBU's program is unique among management information systems online degree programs, as students can easily pick up another concentration to supplement their degree by completing another 12 credits of coursework. Aside from management information systems, students can select from 12 additional concentrations to add a dual concentration to their degree, including business communication, finance, and marketing. DBU has stricter admissions criteria than many other institutions that offer MIS programs. Prospective students should be compatible with DBU's Christian-affiliated mission, have an undergraduate GPA of at least 3.0, and a GMAT score of at least 425. The school also prefers applicants who have at least five years of relevant management experience. Students who have completed at least 12 hours of prior graduate work with a GPA of at least 3.0 also receive priority in admission. DBU's program can be a completion degree, and as a result, completion times vary. DBU is also regionally accredited by the Southern Association of Colleges and Schools Commission on Colleges, and the school's MBA program is nationally accredited by the Accreditation Council for Collegiate Business Schools and Programs. Minot State University ranks in the Top Ten on The Best Online Master's in Management Information Systems Degree Programs! Based in rural North Dakota, Minot State University focuses on arts and sciences, business, and health sciences. MSU has recently expanded to offer some of those programs online, including the school's master of science degree in information systems (MSIS). The 30 credit online program is time-efficient, requiring either a year of full-time study or two years of part-time study to complete, and there are no in-person requirements. The program's curriculum includes relevant coursework in e-business strategy, professional consulting in information systems, and systems design. The professional consulting course actually serves as a capstone experience, as students apply their knowledge by consulting with a business in their respective communities during their final semester. This experience leads many of the MSU's management information systems graduates to work in consulting. All applicants to MSU's online MSIS program must have either a cumulative undergraduate GPA of 2.75 or a minimum GPA of 3.0 during the final 60 credits of study. MSU does not require the GRE or GMAT for admission. Once accepted, all online students receive a discounted online tuition rate, regardless of whether or not they reside in North Dakota. MSU is regionally accredited by the Higher Learning Commission, and the school's MSIS program is nationally accredited by the International Assembly for Collegiate Business Education. Mississippi State University ranks in the Top 15 on The Best Online Master's in Management Information Systems Degree Programs! Based in the college town of Starkville -- or “Stark Vegas,” as some locals call it -- Mississippi State University is one of the state's flagship universities. MSU offers three of its graduate business programs online, including the school's master of science degree in information systems (MSIS). The 30 credit program can be earned online within 12 months. Coursework includes a six-course MIS core with studies in business telecommunications and MIS administration, and a collaborative capstone project. The final four courses are made up of electives. The program does not include on-campus requirements, and students do not need to visit Starkville to earn their degree. Many students in the program are working professionals; most students opt for a part-time approach, taking two courses per semester to earn their degree within two or three years. All applicants to the program must submit GRE or GMAT scores. Transfer students may apply up to six approved credits toward their MSIS degree. Though MSU is a state university, all online students are considered Mississippi residents and are able to pay in-state tuition. MSU is regionally accredited by the Southern Association of Colleges and Schools Commission on Colleges, and the MSIS program itself has received national accreditation from the Association to Advance Collegiate Schools of Business. Florida Institute of Technology Florida Tech Online ranks in the Top 15 on The Best Online Master's in Management Information Systems Degree Programs! A private, space-grant, STEM-focused university based in Melbourne, the Florida Institute of Technology also operates the Nathan M. Bisk College of Business and numerous distance learning programs. The latter two elements combined to produce FIT's master of science in management - information systems program, available with in-person, hybrid, and online options. Students enrolled in the online option are not required to visit campus in Melbourne. The program's 33 credit curriculum includes classic MBA coursework in corporate finance, accounting, and organizational behavior, and adds MIS-specific studies in database, computer systems, and telecommunications management. Students also complete a capstone experience through an applied management project, as students conduct quantitative and qualitative measurement and research to solve a managerial problem. Tuition rates for FIT's online programs are the same regardless of a student's location. FIT takes a holistic approach to evaluating each applicant, and the GRE or GMAT may or may not be required depending on each student's circumstances. For transfer applicants, FIT evaluates transfer credits on a case-by-case basis. MIS coursework is delivered asynchronously, and students can complete assignments and study whenever they want. Each course lasts a total of 15 weeks, and full-time students can earn their MIS degrees within a year. FIT is regionally accredited by the Southern Association of Colleges and Schools Commission on Colleges, and the MIS program is nationally accredited by the International Assembly for Collegiate Business Education. National University ranks in the Top 15 on The Best Online Master's in Management Information Systems Degree Programs! National University's online master of science in management information systems program is a 54 quarter unit program. These 54 units consist of 12 required courses -- including project management and information management -- and a two-course master's research project that serves as a capstone experience. The La Jolla, CA-based school does not offer electives in its management information systems graduate program, as each student completes the exact same 12-course load. Students do not need to visit the Southern California campus to complete the program. National's MIS degree has earned national accreditation from the International Assembly for Collegiate Business Education, and NU itself has earned regional accreditation from the Western Association of Schools and Colleges. NU charges each student in the MIS program the same per-credit tuition rate regardless of where they live. To gain admission to NU, applicants must have earned a minimum undergraduate GPA of 2.5, or a GPA of 2.75 during their final 90 quarter units of study. Students who do not meet this requirement must submit GRE or GMAT scores. Those who have already completed some graduate coursework may transfer up to 13.5 quarter units to the MIS program, provided that they earned a grade of at least “B-” in each course and earned those credits within the last seven years. University of Maryland University College ranks in the Top 15 on The Best Online Master's in Management Information Systems Degree Programs! The University of Maryland - University College celebrated its 70th anniversary in 2017, and spent most of those years primarily serving Prince George's County. Today, however, UMUC is one of the biggest names in distance education, primarily serving full-time working adults, parents, and military members. One of the school's 90+ online programs is the master of science in management degree, which includes a specialization in information systems and services. The program requires students to complete 36 credits, which includes coursework in information systems management, systems analysis, and financial decision making, and a strategic management capstone course. UMUC uses asynchronous learning in an effort to cater to the diversity of working professionals who enroll. Because each student's situation varies, program completion times also vary, though students must earn their degree within five years of continuous study. Though out-of-state students pay higher tuition rates than Maryland residents, all military members pay in-state tuition. UMUC strives to make their programs as affordable as possible for students, and has awarded over $6 million in scholarships each year while also offering interest-free payment plans.Transfer students may apply up to 6 approved credits -- provided that they earned those credits within the past five years -- toward their UMUC master's in MIS online. UMUC is also regionally accredited by the Middle States Commission on Higher Education. Wright State University ranks in the Top 15 on The Best Online Master's in Management Information Systems Degree Programs! A public research university based in suburban Dayton, OH, Wright State University's namesake is Orville and Wilbur Wright, the pioneers of flight. The school offers an excellent master in information systems program. The 33 credit program is cohort-based and uses a blended learning style: students complete asynchronous coursework and four on-campus residencies that include an information systems capstone project. A different sponsoring business creates each capstone project, so courses are different for each cohort. These cohort-based, on-campus residencies mean that students are on the same track for the duration of the program, earning their information systems management degree in exactly one year of study. Aside from capstone projects, the curriculum consists of nine required courses, including studies in data-driven businesses and organizations, IT outsourcing and partnerships, and information assurance. The curriculum does not include any elective courses. While Wright State's MIS program does not require standardized test scores or a minimum undergraduate GPA for acceptance, admission is competitive because of a low number of spaces available in each cohort. The admissions committee prefers applicants have at least three years of relevant work experience in management in information science, technology, or a similar field. Wright State is regionally accredited by the Higher Learning Commission, and the MIS program is nationally accredited by the Association to Advance Collegiate Schools of Business. Bellevue University ranks in the Top 15 on The Best Online Master's in Management Information Systems Degree Programs! A private university in Bellevue, NE, Bellevue University is a leader in adult and continuing education. As such, the school's master of science in management of information systems degree caters to professionals already working in the information systems field. The 36 credit management information systems online degree includes five possible 12-credit concentrations: business analytics, business administration, information security management, cybersecurity, and information technology project management. Regardless of concentration, all students in the program complete a 24 credit core that includes studies in information security management, IT infrastructure, and IT strategy and policy. The core also includes an MIS integrated capstone, which is a survey course covering everything the students learned throughout the program. Students in Bellevue's MIS program pay the same tuition rate regardless of whether or not they reside in Nebraska. Competitive applicants must have earned a minimum undergraduate GPA of 2.5 throughout their final 60 credits. Students who have completed prior graduate coursework must have earned a minimum GPA of 3.0 during their graduate studies. Though many of Bellevue's online programs operate on an accelerated cohort model and the program includes an on-campus component, Bellevue's MIS program uses a traditional, asynchronous distance learning model. Bellevue University is regionally accredited by the Higher Learning Commission, and the information technology project management concentration of the MIS program is nationally accredited by the Global Accreditation Center for Project Management Education Programs.